Film. Film. Film. Maybe some digital. But mainly … PROMOTING FILM! About a year ago, I was surfing the Craigslist photo ads here in Dallas and up came an ad for a free 8×10 view camera. I quickly emailed the person and within 15 minutes I received a message back. A gentlemen was moving out of town who had an old Burke & James Grover 8×10 that he had been meaning to restore & use but had never got around to it. He asked me if I was into large format and stated that he really wanted this camera to go to the right home. I enthusiastically conveyed to him that I was the right person and would eventually make my way up into the world of large format. The Burke & James Grover is a utilitarian view camera that is meant to get the job done. It doesn’t have some of the bells & whistles that current 8×10’s have, but it works well, it’s pretty stable and for all intents and purposes, it was just what I had always wanted and needed. When I arrived at the gentlemen’s home to pick it up, he had a few random camera accessories outside that he later told me was going to throw away on his porch. I looked at them in passing and then rang the door bell. When he greeted me, he was smiling while holding the Burke & James. This was the first time I had seen an 8×10 in person. 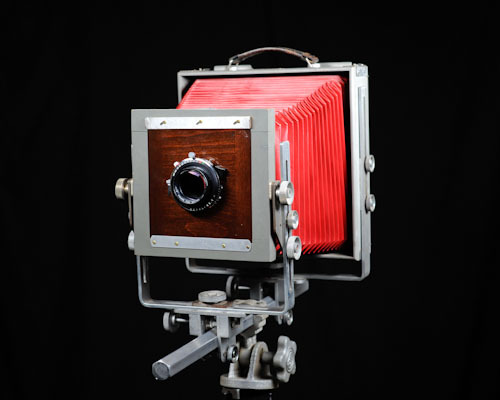 It’s a pretty unique piece of equipment that’s been used for over a century in the world of photography. I can’t state just how excited I was to simply have the skeleton, if you will, of an 8×10. There was no lens, no 8×10 film holders, a busted lens board and frankly, the camera was pretty dusty. He stated that it had been in his garage for quite some time and he did not have the time to restore or use it. After about 20 minutes of photography small-talk, I thanked him emphatically for contacting me back. He chuckled and said “You know what? There were literally 15 to 20 emails about this 8×10 in 15 minutes. If you ever put “Free 8×10″ in an ad, you’d be surprised at how many respond to it.” I grinned a wide smile. “I bet.” I thanked him one last time and then made my exit. I was on cloud nine. I had an 8×10. These things aren’t exactly cheap, and granted this thing isn’t the best 8×10 money can buy, but you know what? It was an 8×10 and more importantly, this 8×10 was going to get a lot of use … eventually. When I got home and showed Synthia the newest acquisition, she was really shocked at the size of this thing and also a little nervous because she knows very well just how into things I can get. “How much is that thing going to cost to get up and running?” she said. “Ummmm .. well it’s not exactly going to be cheap. But, it’s not something I’m going to do tomorrow baby. It’s going to take some time to piece everything together that I’ll need for this.” This put her at ease a little bit and with the placement of the 8×10 on the top of a bookshelf, the notion of using this thing faded away. A few months later, The Impossible Project announced that it was going to start making black & white 8×10 instant film. Whoa. At this point, I was shooting a lot of instant film and the dream of shooting instant film on 8×10 was just that .. a dream. There was no way I could get everything lined up to use this with instant film. It cost so much money and some of the required items needed (Polaroid 8×10 holder & the Polaroid 8×10 processor) were starting to go for astronomical prices on Ebay. On top of that, I didn’t have a lens and I still had a busted lens board. Oh well .. one day. Months went by. My focus was on instant photography and eventually into promoting its use and helping others get into instant via the Instant Film Society. Some of you reading this might know that I’m a pretty persistent person and when I find things that truly strike a chord within me, I obsess over them and learn everything I can about it. That’s happened over the past 9 months with instant film and using Impossible’s film. I love it. In using and promoting this medium, I have come in contact with an amazing network of people that I would have otherwise never tapped into. I’ve met a slew of photographers, educators, enthusiasts and amateurs who all enjoy this form of art. Slowly, things started falling into place. A friend of mine had some extra large format lenses laying around that weren’t getting any use, so I borrowed one of them and ordered a lens board on Ebay that fit the Burke & James. Also, maybe two months ago, I was buying film at Don’s Used Photo Equipment here in Dallas and on my way out, I noticed a Polaroid 8×10 Land Film Holder sitting on the shelf. I walked passed it and before I got to the door, I thought to myself “This is one of those serendipitous situations”. I walked back over to the 8×10 holder and asked the owner, Todd, what he was selling this for. He said “Man .. I have no idea. Make me an offer.” I gave him a number which he liked and then out of nowhere he said “You know .. 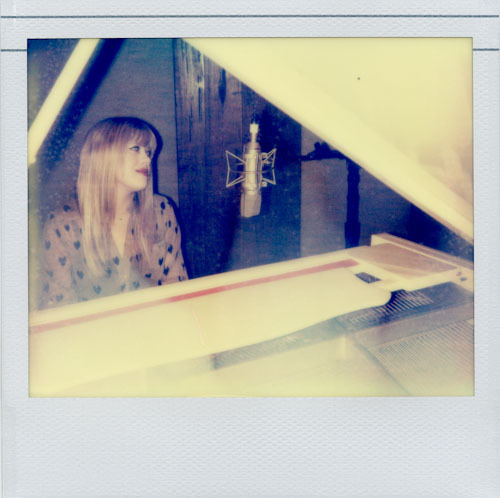 I might have some Polaroid 8×10 in the back. Let me go see.” I started to get excited. About 5 minutes later he came back with an unmarked box and was smiling. “Let’s open this thing up and see what’s in it.” A pocket knife flipped open and within a few seconds 15 negatives & positives of Polaroid 809 revealed themselves. I asked him if it had been cold stored. It hadn’t, but I knew that he kept his place at a decent temperature for storage. After some debate and negotiating, we made a deal that I was very happy with. When I got back home, I was curious if the pods that held the developer paste had dried up in storage (always a risk with expired instant film). I opened up the cartridge that held the 15 positives and gently touched a pod. They were soft to the touch. The magical goop hadn’t hardened at all. There was still one key thing needed; an 8×10 Polaroid processor. In order to develop Polaroid 8×10 film, you need a machine that runs the positive and negative side of the film through these giant rollers (either electronically or manually) to spread the developing paste in between them so the development process starts. Polaroid checked out of the instant market in 2008 and these machines hadn’t been made in years. Sure they are out there, but they are expensive. These processors are in high demand. When Impossible Project announced they were going to start making 8×10 instant film, the price of the processors skyrocketed during the following months, from under $100 on average to $500-1000+. Yikes. Not exactly cheap. When I got back home from Don’s, I started looking at instant images shot on 8×10 cameras and I stumbled upon a girl in town who had shot Impossible’s 8×10 test film. I messaged her up and told her about my interest in 8×10 and asked if she had access to a Polaroid processor. Annie was in school in Florida, and she did have a working processor, but wasn’t going to be back until Christmas. Some time went by and I continually scoured the internet, looking for something that I could possibly pick up. Nothing. Everything was out of my budget and it seemed like the 8×10 instant photography dream would just have to wait. Then one day, while searching online, I found a guy in Kansas that was selling one. I emailed him, told him a little about myself and what I was doing here in Texas to promote instant film with the Instant Film Society. I asked if he would be interested in donating the processor so I could use it to help teach others about instant photography and help spread the love of instant. He messaged me back, told me that he wished that he could donate to such a worthy cause, but he really needed the money for it. Totally understandable. It was worth a shot. He did say however, that he was willing to work with me on it and would like to come to some sort of an agreement that was beneficial for both us. After some quick negotiating a happy medium was met and within a few days he shipped off the processor. I had him send it to my friend’s camera repair shop, just in case I wasn’t home to receive it, and when I got the call that it had arrived, I raced up there to go pick it up and test it out. I ran inside and picked up the box. Uh oh. I could hear what sounded like small bits of plastic moving around. I opened up the box, which was packaged to perfection I might add, and pulled out the 8×10 Polaroid Processor. I flipped the cover open, turned some tabs and removed the rollers. Oh boy. Sitting before me were two rollers that were completely detached and busted from the roller assembly that holds them in place. This is not good. I called the gentlemen that I had purchased it from on the phone and within a few minutes we were discussing how this could have happened and what we were going to do. Well, at least I had a processor. Not a functional one at this moment, but I knew with a little bit of work, things would be OK. I called my friend Steve (who was introduced to me by Annie actually and also has an 8×10 processor) on the phone and he and I started brainstorming on what we could possibly do. He stated that I probably shouldn’t repackage it up and ship it back, because at this point, a) I had a processor b) I might be able to find a non-working processor to repair this one and have extra parts for later .. good point .. and c) maybe .. just maybe we could get some parts printed with a 3D printer or have them created from a mold made from parts out of his. Challenging but possible. I assume these processors haven’t had replacement parts made for them in YEARS. My options were limited. Saturday rolled around and my brother Josh, who’s worked extensively with Sarah over the past year producing new songs with her with his engineering parter Brad, opened up the music studio they work out of and we shot a handful of images there. For all of these images, I used a three light setup with Alien Bees. If you’re interested in heavy technical details I can give them to you. Just send a message my way to info@goodephotography.biz and I’ll be happy to pass the info along. Following Saturday’s shoot, we met back up on Sunday at a photography studio in Richardson to shoot some more material. This time around I wanted to capture a really good close-up of Sarah, a full length shot and of course anything else that came to mind. When she arrived, I set up a beauty dish and a couple of strip boxes and set the 8×10 up. This time around, because of how close I had to focus, the bellows was extended waaaaay out. I think the bellows extension factor ended up being about a stop and a half if not a little more (thanks for the tip Mat Marrash). Nervously, I slipped the holder into place, held my breath, hoped that Sarah hadn’t rocked too far back or forward and tripped the shutter. Sweet! Another successful image. Phew! Shooting this stuff isn’t exactly easy and it definitely makes you think about everything .. i mean EVERYTHING when shooting each image. It’s just a little bit stressful, but I’m OK with that. I set up the lights for a full length shot and Sarah got changed into another outfit. Admittedly, the first image I took in this scene was about a stop under-exposed (I had a hunch but didn’t listen to myself .. I’ll listen next time). I loaded up another image and tried one more time. Bam. By this time, we had probably spent a good 2-3 hours in the studio setting up lights and arranging things so they were just right. Out of all the images taken, I had yet to take an image outdoors. Synthia had a great idea and asked what it would look like if Sarah held the close up we had taken earlier in front of her face for an image. Brilliant. I am a fan of picture in picture images. Why not take a picture in picture with Impossible’s 8×10 PQ? We set up outdoors in the alleyway (it was so cold!) and I snapped this image of Sarah .. It was getting close to sunset, so we decided to take a break and would meet back up in an hour to take another image. For this image, which ended up being the final one of the day, I wanted to shoot a silhouette of Sarah’s profile using a two light setup. I set up a speedlight behind her with a reflector around it to create a circular shape on the wall and then set up a strobe with a stripbox to shine a little bit of light on her face. Once it was metered out and she was in the right position, you guessed it, I did the 8×10 Polaroid shuffle and waited with Sarah as the image developed. My thoughts on this film? Challenging, elegant and unforgiving. There are so many variables that you have to think of and be aware of when shooting 8×10 instant film. It really tests your skills. This stuff isn’t child’s play. I can’t stress enough just how stressful it can be to shoot, but are the results worth it? Absolutely. 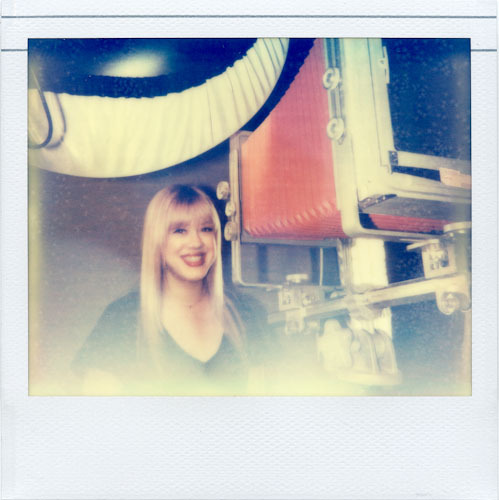 The experience of shooting Impossible’s 8×10 instant film are unlike any other that you will have. It creates a special bond between the photographer and the person being shot. You know that all of the work put into each image will create something unique .. something beautiful. When you shoot 8×10 instant film, you’re not just creating a photograph .. you’re creating a tangible, analog work of art. What’s next in my journey with 8×10? Sharing this experience with others. 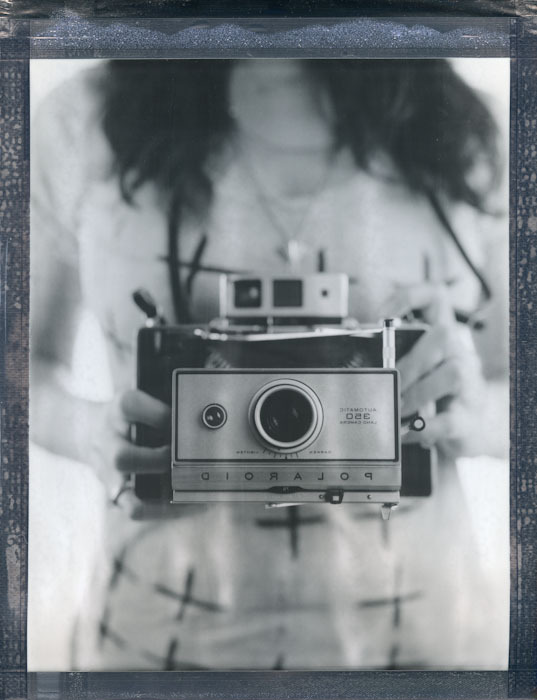 On January 26th, I’m hosting a PolaWalk in Dallas, TX with the Instant Film Society. If you’re in the area and would like to witness this process in action, you’re more than welcome to join us. We’ll be shooting 8×10 instant images of the participants of the walk at the cost of film (hopefully we’ll have enough). If you’d like more information, click here. PS – Sarah Sellers, thank you for trusting me to shoot these images with you. Synthia and I had such a great time. It was a weekend we will NEVER forget. Awesome, Justin! Am so glad this worked out for you. The pictures are just breathtaking. And I’m sure they are even more amazing in person. Great story and congrats on some great images and the camera!! Beautiful shots Justin! Thank you for being so generous in sharing your knowledge! It’s my pleasure Melinda. Thanks for the comments and for taking the time to read this post. 🙂 I’ll see you at the upcoming PolaWalk! Congratulations. Love reading about your challenging, yet rewarding experience. Thanks for sharing. I’ll keep you posted Sudha. Thanks for taking the time to read about my experience. Oh my…. I hope I get the chance to shoot 8×10… Freakin’ GORGEOUS! Jade – I hope you do too! There is nothing like it. Thoughts race through my mind as the image is developing … I second guess every decision made … my heart pumps rapidly as I lift the lid of the processor and flip the image over to reveal the print … it gets me every time. I’m hooked. Lovely article and shots. I’m big fans of polaroid and really wanted to get 8×10 for it. What is the lens you use for full bosy shot and half body shot? You are currently reading My journey into the world of 8×10 Instant Photography at Justin Goode.